. ::Living in Japan : The blog::. As you may have heard, there was a huge earthquake in Chile. Because of that, tsunami was expected other countries including Japan. The tsunami warning was on TV the whole day. Here's a map from Yahoo! 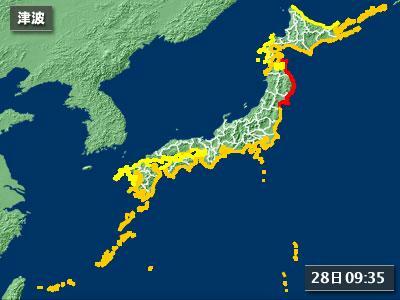 Japan showing areas expected to be affected. The first wave of tsunami has arrived with just over 1 meter of tsunami wave. However, the second wave is expected to be larger than the 1st one. Stay away from the beach today! Haven't been out too much lately because I have pollen allergy. But this is not the sign of spring I want to talk about today. It's the Ume flower (plum blossom). These are white Ume flowers but you can see a lot of pink ones too. This flower is often mistaken with the Sakura (Cherry Blossom) because it is very similar. I can't really tell you what are the differences because I don't really know. However, Ume flower blooms a lot earlier than Sakura. If you've been to Akihabara lately, you know that the station is under heavy renovation (yet again). But I found something interesting there. 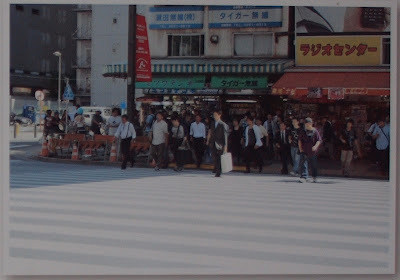 The photos comparing old Akihabara and new Akihabara were shown in front of the station. I took photos of the photos. 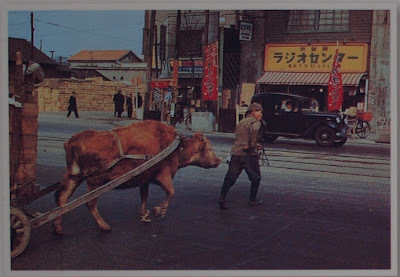 Here's the old Akihabara maybe in the 1930s taken in front of "Radio Center" shop. You can see an antique car and also tracks for trams. Here's how it looks like today. You can notice that the "Radio Center" shop is still there after all this time. But today, it is a busy crossing spot in front of the station just under the Yamanote line rail bridge. No more trams (and cows). I am busy again today so I ate in my work place. Here's what I had for lunch. It's a bento of Anago Chirashi. Chirashi means it's like Chirashi-zushi, so the rice below is vinegar rice. 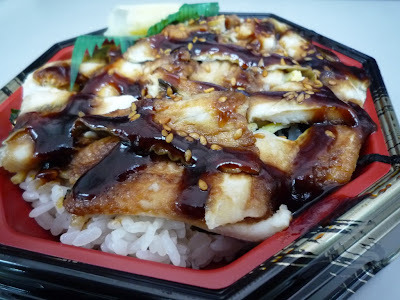 And on top is Anago with sweet sauce or "ama-tare". Just want to share what I had for lunch. It's not enough because I always got a big appetite but I'll eat more for dinner. Yesterday I ate this Buntan fruit. It was my first. 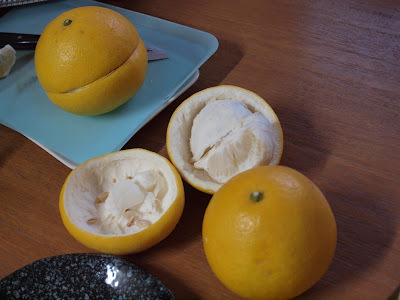 Although in Japan it is called Buntan, I think more people are familiar with Pomelo (or the scientific name Citrus maxima), a fruit with originated from South East Asia countries such as Vietnam and Philippines. This particular Buntan was produced in Kochi prefecture and is called Tosa Buntan. Kochi prefecture and partsof Shikoku are known to be the producers citrus in Japan especially mikan. Information about Japan in English is scarce. Here I'll try to write just about every aspects of Japan through my experience living here. Feel free to leave any comments or just click the "clap" button if you like it. Copyright © . ::Living in Japan : The blog::. All Rights Reserved.